Robert Kleiner, Boston Convention, 1991. 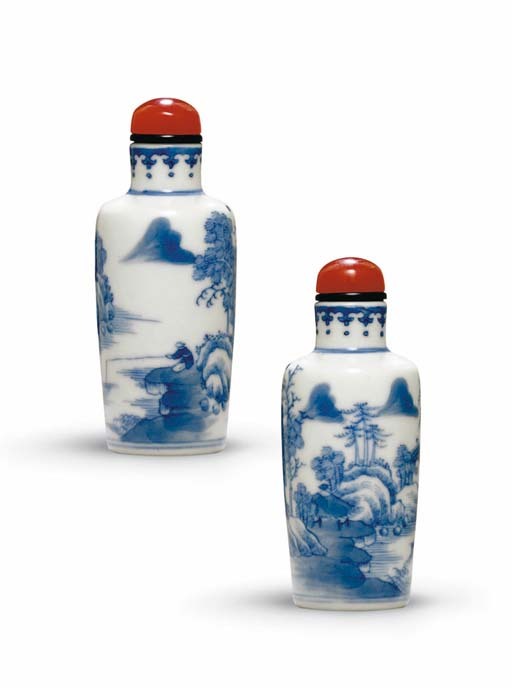 This bottle belongs to a group of a large number of cylindrical porcelain bottles decorated in underglaze blue which became popular in the mid-Qing period. Porcelain became the ideal cheap material from which to produce large quantities of well-made containers decorated with meaningful designs for a vastly growing audience of snuff-takers as the habit spread to the whole population from its roots at Court. See another bottle painted with a landscape and with a similar neck border, illustrated by R. Kleiner, Chinese Snuff Bottles from the Collection of John Ault, p. 95, no. 163; and one illustrated by R. Hall, Chinese Snuff Bottles. Masterpieces from the Reitberg Museum, Zurich, pp. 28-9, no. 8.